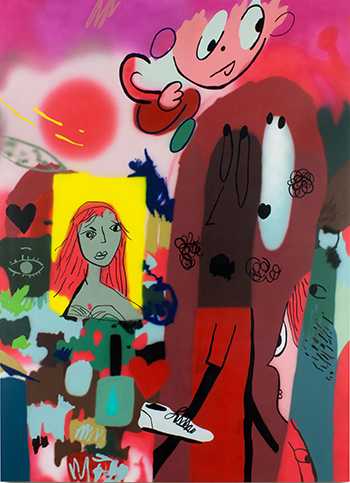 From Friday May 27, Kaikai Kiki Gallery will present the first Japanese solo exhibition by artist Joshua Nathanson. The exhibition will feature over ten paintings by the artist, examples of which have already captured the admiration of Takashi Murakami. Thematically, the paintings will explore the experience of shopping, with each work having begun from sketches made at various Los Angeles shopping malls . I have this image in my head of my brother and I as little kids entering the Willowbrook Mall in Houston, Texas. We moved around a lot when we were growing up but we always lived in the American suburbs and there was always a mall nearby. We loved these places. In this vision I picture us frozen in motion as we burst in from the dreary parking lot. We are mid-air, our feet spinning like cartoon characters and we are exclaiming “YES!” as we head toward the arcade, food court and surf shop. It was like jumping into the TV and being part of the most magical, hyped-up, wide-awake stuff that the world had to offer. I also remember feeling very tranquil at the mall. Listening to the muffled din of music and people, watching the perfectly smooth waterfalls in the fountains and standing next to, and almost inside, the immense skylights near the escalators and seeing it all from a distance. It made me wonder “what more do we want”? Sometimes I would crawl under the clothing racks at Macy’s and imagine the end of the world and it wasn’t really a sad or scary thought as much as a feeling of true satisfaction. I’m still fond of the mall but as an adult I have much more cynical view. My youthful exuberance is tempered by the awareness of the suffering, waste and destruction needed to build these modern-day cathedrals and to keep them up and running. And I’m skeptical of our faith in consumption and our need for spectacle. Plus, I get the sense that malls aren’t just becoming nostalgic to me but to society in general – with some of the newest malls, like the Americana, attempting to recreate an idealized American main street from roughly the early 1900s complete with Victorian architecture, vintage street lamps and trolley cars. Many of the more modern-looking malls, like the kind I grew up with, are on the decline. I guess people are doing more online shopping but in any case I get the sense that shopping at a mall is becoming a less essential experience. Like we are pretending to do something old-timey in the way we might visit a Renaissance Fair – watching a bard sing a song about his king as we eat a giant turkey leg – half observer and half participant of an outmoded lifestyle. But what’s weird about some of the classic American malls is that they still feel so new and I imagine that they might always feel this way. How cool is it that The Glendale Galleria, built 40 years ago, still feels newer than The Americana (across the street) built just a few years ago. It’s as if newness (modernism?) is a style rather than a historical fact. There was something shameless and naive about these classic-modernist malls. Capitalism’s earnest attempt to create a self-sufficient bio-dome with us as insects and each store a flower attempting to woo us. Everything folded inward and hitting all your senses really hard – sights, smells, sounds and people moving everywhere, not just side-to-side but up, down and through. With all of these ideas in mind I went to some malls in Los Angeles and made sketches on my iPad that I later turned into paintings. It was really strange sitting there. I felt like I should be moving, that I was trespassing and that I was making the guys selling perfume from the kiosk nervous rather than the other way around. I guess I was just using the mall in the wrong way. Instead of shopping and consuming I was passively observing. It reminded me that the mall is a private place. There was a lot to look at and everyone was on the hunt for something or other. A great spectrum of average people surrounded by giant advertisements featuring God-like people who seem to live in some ideal dream or another. But no one was really thinking about it too hard and I had to admit that most people seemed genuinely happy. I tried to draw some of what I actually saw mixed with what I felt I was seeing and then some of the things that sitting there led me to think about. This style might be considered a mix of impressionism, abstraction, and surrealism. But my ultimate goal was to uncover some specific feelings and to convey them to the viewer without critiquing them too much. I was interested in doing this because I don’t know exactly how I feel about the mall but I’ve always been drawn to it. One of the people I follow on Instagram is Liz Goldman, whose handle is @lizny3. Her curated posts on artists and artworks are amazing and informative, so I have been following her for the past year or so. As a collector, she seems to frequently visit artists’ studios and galleries before their shows open and, as such, gets to report on the most exciting goings-on from the thick of the art scene. In one of these reports, I saw the preparations for a solo exhibition by Joshua Nathanson at Various Small Fires in LA. It was to open on September 11, 2015 and I happened to be in LA at the time, so I went to see the show the day after it opened. The show was already near sold out and there were just two available works left, which I had the pleasure of acquiring. Buying these works made me extremely happy. But why? Joshua’s works unfold with a nonchalant scenery that reminds me of the folk songs I used to listen to in high school, the kind that unaffectedly depict the details of daily life. Did he make these paintings on an iPad? They are light and soft, very cozy. As a Japanese artist, contemporary art for me has always been that world where the the supremacy of air-tight concepts is upheld, something that required a dedicated study of history. I had thought it the sort of thing one discusses somberly with arms crossed. Of course, that’s probably not the case in reality, but it made me happy to fantasize such a production process. And yet, when I looked into his work and background more, I learned that he had studied under Mike Kelly, Christopher Williams, Liz Larner, Haim Steinbeck, and Marilyn Minter. I then understood that he had arrived at his current style knowingly. In any case, as Kaikai Kiki is a gallery, we must present the kind of works that people will want to have and that is the crucial point of this show. This show is for those of you who are looking for such works!! !